LittleTaniwha: About me - a short novel LOL! About me - a short novel LOL! I have drawn pictures and painted ever since I can remember (I’m sure I drove my Mum crazy with thousands of ‘artworks’ brought home from pre-school and primary school). 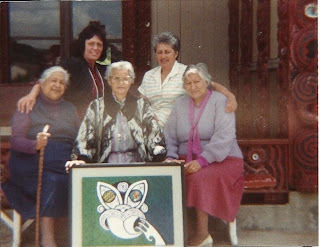 I was fortunate enough to have Robyn Kahukiwa as my art teacher for most of my years at Mana College in Porirua, during that time she was working on her “Wahine Toa’ book/exhibition. Robyn continues to be a great motivation and inspiration to me as an artist. Speaking of which, it took a long time before I was comfortable with calling myself an ‘artist’, I felt like a fraud, I was surely just a ‘dabbler’ in art? Apart from spending a short period of time in the mid-80’s in Auckland, creating bone-carvings and teaching bone-carving at a local Community House in Devonport, I did not indulge in anything as esoteric as art…for some time after that I was far too busy child-rearing with two small children, (Waiata and Honore), and care-giving other children through Barnardos. 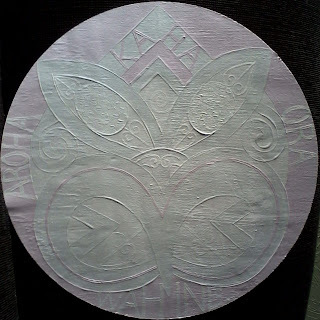 After moving back down to Porirua in the late 80’s, I was lucky enough to be accepted on a Taha Maori course being offered on Takapuwahia Marae. 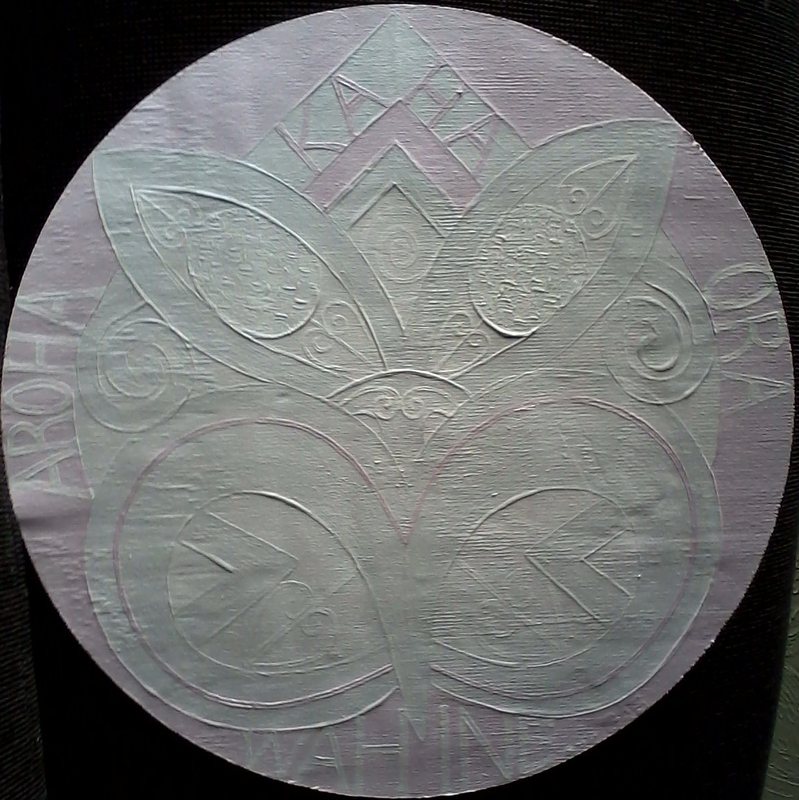 I spent nine months (it was supposed to be a three month course) learning nga taonga - te reo Maori me ona tikanga. 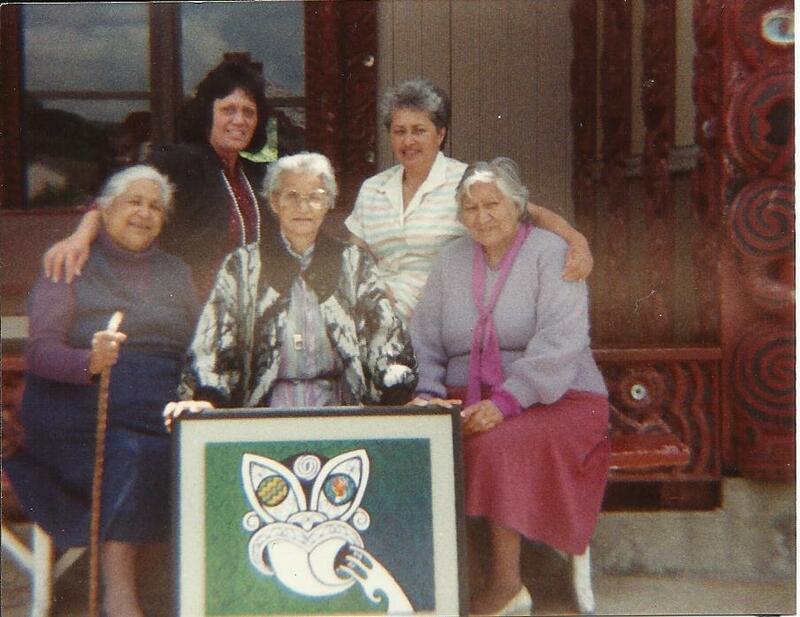 Takapuwahia Marae Aunties with gift - "Te Ahi Kaa"
I got my ‘painting on’ again at the end of the course and gifted the ‘Aunties’ (tutors) at the Marae a painting. 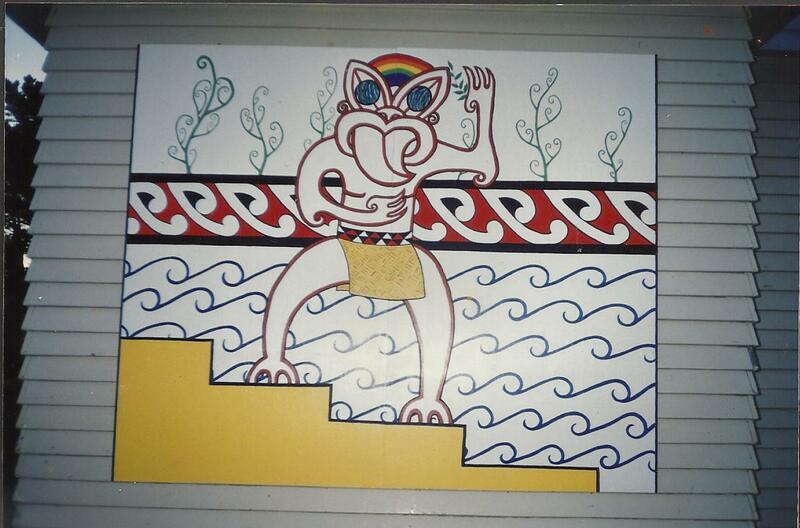 In the early 90’s I did a large mural for Titahi Bay North School (my two children were attending the bi-lingual unit and I was teacher-aiding there). 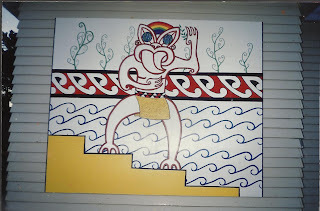 Titahi bay North School Mural - "Poutama Matauranga"
I was doing some small paintings mostly as gifts for friends and family. In 1993, I was blessed with child number three, (Te Aihe) and within twelve months I began an adventure into retail with my lovely friend Meri, we opened a small ‘new-age’ shop in Titahi Bay called ‘Aihe Crystals and Crafts’. I starting playing with aqua pencils on watercolour paper during this time and created a few ‘mandala’ (circular spiritual patterns/drawings) and some paintings for friends and customers; I met some amazing people, learned a lot about running a shop and I also learned the lesson that a business can’t run on love alone. The next few years were busy with child-rearing, teacher-aiding and surviving as a solo parent – no painting… I still didn’t see myself as an artist at this stage. In 1999 I was accepted into the Wellington College of Education and began my three year academic journey to become a Primary teacher. Visual Art block courses and a trip to the Cook Islands for a Multi-Cultural Studies Course. I was in my element and produced quite a bit of work, some of which was exhibited there along-side other students’ work. I think this was when I started to admit to myself that I am an artist, but just quietly. I began exploring pacific design/symbolism during this time in response to my Samoan partner Andrew and his family becoming a part of my life. Teaching has been a great experience that has enabled me to use my creativity to set up my classroom learning environments, teach art to my students (year 1 – 6) and contribute artistically to various aspects of school life such as school production set design. 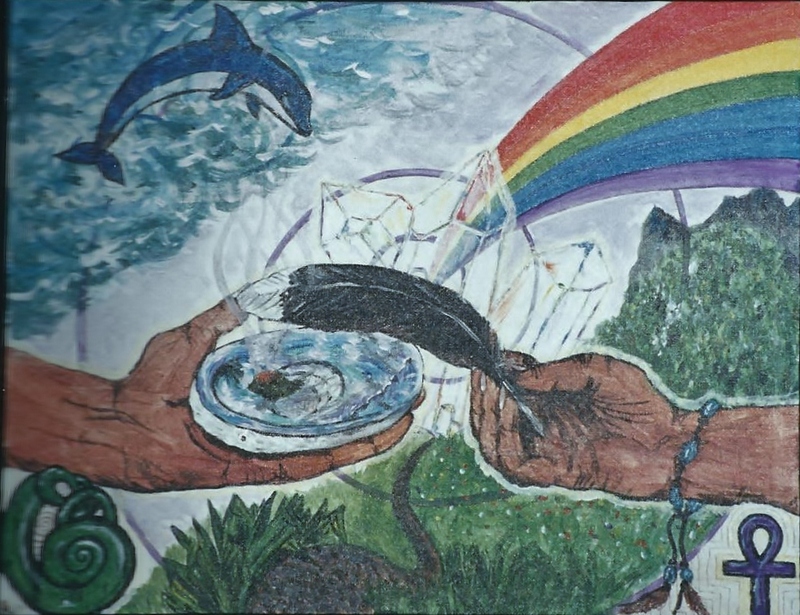 I have taught mainly in low-decile, multi-cultural schools that have a high Polynesian and Maori population. I absolutely loved my students; I truly appreciated the different cultures to which my students belonged and I soaked up as much of their cultures and respective art/symbolism as I could. 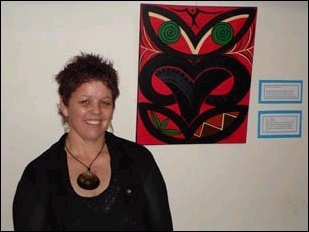 I didn’t really have time to engage in personal artistic pursuits until mid-2007 when I painted for a fundraiser for Porirua School (where I was working), I organised and set up a Silent Auction and donated a painting for it. Over the next few years, I continued to dabble in art doing the occasional painting on commission or for friends and family, but my focus was well and truly grounded in child-rearing. I had two more beautiful children, (Rohan and Bronte), with Andrew; and my daughter Waiata gave me three precious part Cook Island mokos (grandchildren), who I have been caring for through Porse. I was getting to the stage where I felt was going to burst if I didn’t find an outlet for the frustrated artist in me!! In late 2009, a teaching colleague (and long-time friend) asked me to come for a term and teach art to a small group of talented students; that got my creative juices flowing! I had a lovely group of students once a week for a term, which I took step-by-step through the painting processes using NZ artists such as Robyn Kahukiwa (who else?) and Don Binney as motivation. By the time both of my youngest children and two of my mokos were at school, I had made the decision that I was going to work towards bringing in an income that was time-flexible, capitalised on my talents/abilities and above all –I was not going to settle for less than working at something I enjoy/love! A good friend of mine (and her very patient husband) offered me space in their rumpus room to use as a studio and the key to their house so I could have daytime access, an offer that I very gratefully accepted. I began collecting old photo-frames, used/unwanted canvasses and off-cuts of plywood to use for my paintings. And so the journey begins… along with doing a bit of ‘relief/supply’ teaching to keep my hand in: I have developed an art extension programme to take into schools to work with small groups of talented, artistic students; I have been painting in my wee ‘studio’ and creating enough paintings to put together an exhibition; I have set up a blog (a triumph for this I.T.-challenged arty type) through which to sell my paintings and visual art teaching resources; and I am in the process of developing resource kits for primary (Years 1-8) and ECE (kindergarten - new entrants) based on Maori and Pacific designs. I think that if you can dream it - you can do it!! If you create art – you ARE an ARTIST! !